We are Rocknife, the team behind the new name in beautiful Kitchen Ceramic Knives for your home or workplace kitchen. We are driven by the desire to be better, instincts for good designs, a strong ambition to make a difference in kitchenware and the willingness to embrace new manufacturing processes. 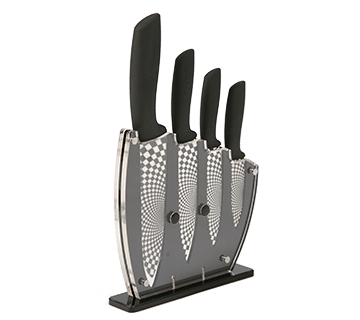 Specialising in Ceramic Kitchen Knives, Rocknife creates and designs our own kitchenware, from the shape of a handle to the design on the blade. Our designers carefully put every aspect of each product that is created by Rocknife together before being prototyped and tested. Only after thorough testing, product quality control and evaluation have taken place will a design be sent for preliminary production. Depending on the response from our extensive user base, each product has to pass the final quality test, by you - our customers. You can be sure that every Ceramic Knife or product that you view on this website will have been through all these processes. Our knives are recognised by professional chefs and used extensively by thousands of people in their home or workplace kitchens. Man became man when he discovered how to sharpen rocks to help him cut, dig, defend and utilise the world around him. The Stone Age was born and man ruled the world, it was only a matter of time before man made fire and then man was able to make Bronze, a mixture of Tin and Iron. The dawn of knives had arrived. Yet, for the next few millennia, man continued using first Bronze, then Iron and finally Steel for their knives. None were perfect, they snapped, rusted, needed regular sharpening and left their mark on anything they cut, but science and technology was catching up. Rock, in the form of Zirconium Oxide or Ceramic, returned. If you have broken a plate, you will know what we mean. The sharp edge is legendary. Using state of the art manufacturing processes that include the pressing and hardening of Ceramic to 400 tons per inch, it has led to a material that reaches 6 or higher on the Mohs Scale. It is not Diamond, but Ceramic is much closer than Steel. 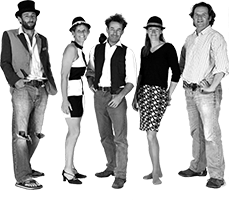 Hi we're the team at Rocknife where we design and manufacture the best Kitchenware in the world. We love our jobs, we love making things that bring style and quality into peoples kitchens and workplaces, Damian is the lead designer, having created the original Rocknife, Tom is head of marketing and our lead copywriter, Guy is the illustrator and web designer, Madeleine our award winning photographer and Henny who does more than anyone else, head of fulfilment and customer service. Please take a moment to read some of our Reviews that real customers have been writing about our Rocknives. Zirconium Dioxide is one of the most studied Ceramic materials and is an extremely refractory material. When the Zirconium is blended with some other oxides, it stabilises and the resulting material has superior thermal, mechanical and electrical properties. Going through the fracture toughness process, it significantly extends the reliability and lifetime of products made with stabilised Zirconia. (Source - Wikipedia. This website is packed with goodness and it works on your Mobile Phones and Tablets as well. We felt that it was vital to give you a website that works anywhere, on any device and in any situation. Login to your account to view old orders, make new ones and give gifts to loved ones. We hope that you have enjoyed your experience with Rocknife so far. Every Rocknife purchase is a gift. We believe that when the Postman delivers your parcel, we are giving you the gift of a superior product. It is yours for life and the care and attention to every part of the experience is something we value the most. We have spent time ensuring every Ceramic Knife is perfect in every way - Contact us and share your experience with us.